Sarthis Idren is ready to fight for his Skooma business. 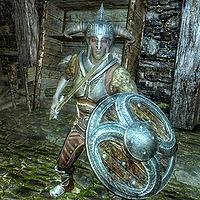 Sarthis Idren is a Dunmer bandit and skooma dealer based at the Riften Warehouse. He is a source of displeasure for the jarls of Riften, who have tried to get rid of him. Unfortunately for them, he has corrupted some of Riften's guards, and they tip him off when the Jarl organizes a raid on the warehouse. He wears leveled armor and carries a key. Sarthis has the sound of a giant breathing attached to him for no reason. This page was last modified on 19 December 2017, at 00:28.